Meal prepping is the secret to a healthy lifestyle. There is only one problem, you got to eat the same dish 4-5 days in a row. 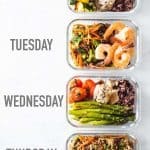 You need meal prep ideas? Here are 4 different meals all made in one go. How to Meal Prep 2.0 so to speak. Meal prep recipes don’t HAVE to be boring and monotonous. I’ve worked on many different meal prep ideas, such as these healthy meal prep bowls or these Vietnamese Chicken Meal Prep Bowls. This time however, I wanted to challenge myself to create something even better. Another level of meal prepping so to speak. The 2.0 of meal prepping. 4 different meals all made in one go. When Lundberg reached out to me asking if I could work on some meal prep ideas for them I was pumped! They make my favorite rice blends and those couldn’t fit any better into meal prep bowls!! How does one go about planning 4 meals for the week ahead that are not all the same? Start by choosing your whole grain. The whole grain will be the same in all 4 dishes. I love Lundberg’s Organic Wild Blend Rice because I get 5 types of rice in one pack. Whole grains keep you fuller longer and are a necessity for take-to-work lunch bowls if you have long days at the office. Then choose 2-3 types of protein to switch it up. This time I chose egg, chicken and shrimps. They all cook super fast and easy and keep meal prep time down. I’ve also made bowls with 8-hour slow-cooked pulled beef though or home cooked pinto beans that need to soak 12 hours and then be cooked several hours. It’s all about personal preference and a matter of organization. If you need to be quick choose eggs, fish, seafood, chicken breast, turkey breast. If you have more time on hand cook beef, chickpeas, beans, lentils, pork etc. Choose as maaany vegetables as you can. The more the better. All the colors of the rainbow and especially many green ones. For this example I chose 7 vegetables: onion, zucchini, bell pepper, asparagus, cherry tomatoes, peas, carrots and broccoli. 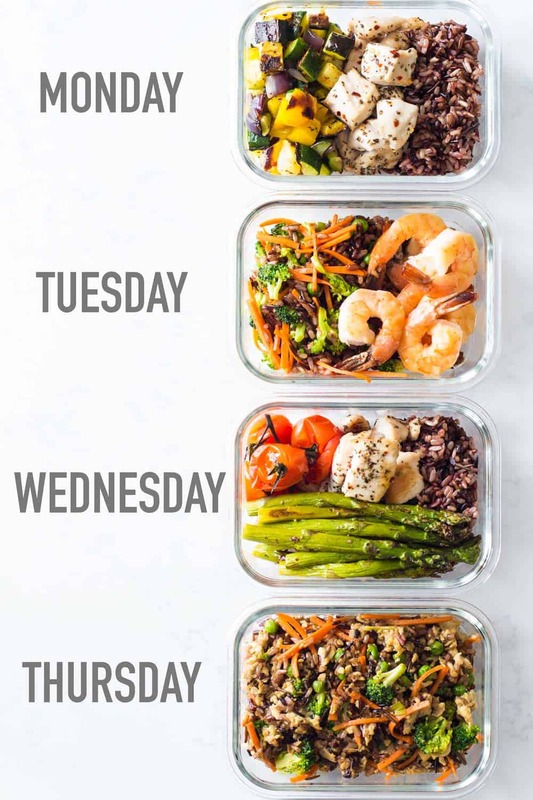 You might have noticed that most meal prep recipes are only made for 4 days. There is an important reason behind this. It’s not like Friday is cheat day, haha. You wish! It’s because most ingredients last only 3-4 days in the refrigerator. Especially all the proteins, be it animal protein or plant protein. I’ve eaten both on the 5th day without a problem but it simply becomes risky. 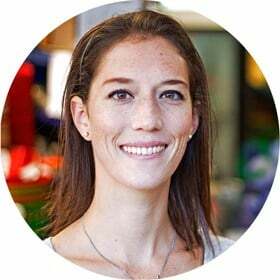 Can I meal prep eggs? Yes, for up to 4 days. Can I meal prep chicken? Yes, for up to 4 days. Can I meal prep shrimps? Yes, for up to 4 days, better 3. Veggies are a little easier once they’ve been cooked. Some raw veggies have a harder time keeping fresh, raw greens such as baby spinach or lettuce for example. It all depends how fresh they were when you bought them though. I’ve head heads of lettuce in the fridge for over a week in perfect conditions. Others however started being sad after only 2 days. Find out when your supermarket gets their produce and go buy that day to ensure you have the freshest stuff. Or go to the market and small butcher in the first place to get the freshest ingredients. So basically the how to meal prep 101 is >> buy FRESH ingredients. Those are just a couple tips also applicable to your own meal prep ideas. This depends hugely on where you are eating your lunch and how you commute (if at all) to the place you’ll have your meal. I work from home and eat at home so for me I like to use exclusively glass containers * with airtight snap locking lids. They are a very very safe material, great for reheating and last foreeeever. My husband commutes by bike to work so I prefer not to send glass in his backpack and he packs his lunch into these stainless steel containers * that are totally leek proof, an ultra safe material and pretty much unbreakable and less heavy than glass. When we have to freeze meals or we have to take larger quantities with us someplace and space and weight are an issue, I simply use freezer bags * to store the individual parts of my meals separately. Big big shout out to this amazing company for sponsoring this post. You are amazing! I am so happy I was given the opportunity to create these meal prep recipes for you! And now, thank YOU, my lovely readers, for supporting the brands that support Green Healthy Cooking! I hope you love this meal prep idea as much as I did! Make sure to tag @greenhealthycooking when you post a photo of your finished dish. I’d love to see! Meal prepping is the secret to a healthy lifestyle. There is only one problem, you got to eat the same dish 4-5 days in a row. You need meal prep ideas? Here are 4 different meals all made in one go. How to Meal Prep 2.0 so to speak. 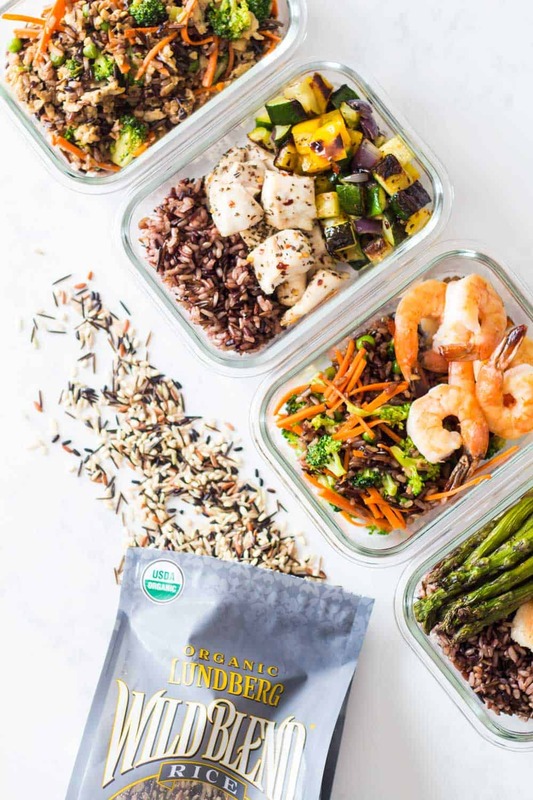 Meal prep recipes don't HAVE to be boring and monotonous. Cook Wild Blend Rice as instructed on the package. (Bonus Tip: in the instant pot it takes just 22 minutes high pressure + 10 minutes natural pressure release and it's done). Peel and finely slice carrot; wash, dry and cut broccoli florets into small pieces. Set aside. Rinse and paper towel dry shrimps. Set aside. Peel and dice red onion; wash, dry and dice zucchini, bell pepper, and asparagus; wash and dry cherry tomatoes. Place vegetables on a baking sheet, drizzle with avocado oil and sprinkle with sea salt, pepper, basil, oregano and red pepper flakes. Dice chicken breast, place on a separate baking sheet and drizzle with avocado oil and sprinkle with same herbs and spices as veggies. Mix with your hands then distribute chicken in one layer with space in between each chicken piece. In the meantime, (if rice is finished cooking), heat a skillet over medium heat. Wash, dry and finely chop spring onion; peel and crush garlic, peel and grate ginger. Add a big splash of avocado oil to hot skillet, then add chopped spring onion, crushed garlic and grated ginger to skillet and sauté for about 1 minutes. Then add about 2/3 of the cooked Wild Blend Rice, the sliced carrot and the cut up broccoli florets and stir fry until vegetables get a strong color. Add peas, soy sauce and sesame seed and keep stirring until well combined and the peas defrosted. 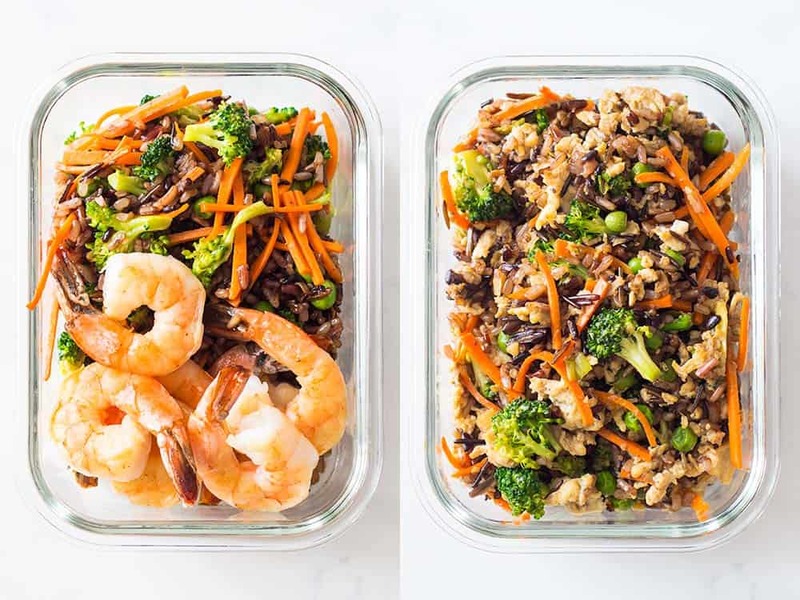 Remove half of the rice stir-fry and add to one of our lunch containers. Move the other half still in the skillet all to one side and add two eggs to the empty side of the skillet and scramble there, then mix with the rice/veggies and once well combined serve into one of your lunch containers. Add a splash of avocado oil to your dirty pan and cook shrimps for about 1 minute per side or until strong orange. Add a splash of soy sauce during the last 30 seconds cooking time. Then add cooked shrimps to the lunch container with the rice stir-fry that has NO egg. Divide the remaining 1/3 of rice still in your pot between the two empty lunch containers, add half the chicken to one container and the other half to the other container. 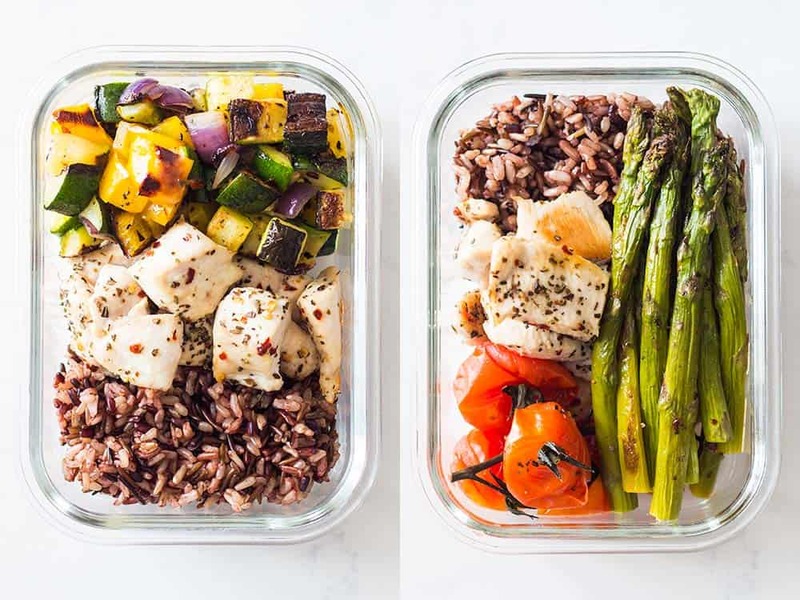 Add roasted red onion, zucchini and bell pepper to one rice/chicken bowl and roasted asparagus and cherry tomatoes to the other. Store in the refrigerator for up to 4 days. Eat either cold or reheat the day you'll eat it. I love this idea! The major thing I struggle with is lack of variety when meal prepping and I usually end up throwing at least on meal away. Do you have any more 2.0 plans? i wonder if the calories is per one bowl or for all of the meals for the whole week? It’s per serving, so 1 bowl. I couldn’t calculate each individual bowl of course so it’s the total calories divided by 4. One bowl might have a little more and another a little less.